Morrissey (left) and Interpol (Paul Bank pictured) head out on tour together this fall. Panic on the streets of San Diego: On Tuesday morning, Morrissey and Interpol announced a 14-date fall tour that brings them to Pechanga Arena on Sunday, Oct. 6. The former Smiths frontman and the post-punk/alt-rock luminaries hit the road on Sept. 5 in Columbia, Maryland and wrap it up one month later right here in America's Finest City. Tickets go on sale to the general public on Friday, April 12, at 10 a.m. local time via AXS.com. Various pre-sale options are also available. Not so coincidentally, both artists have releases on the way: Morrissey's due to drop "California Sun" (a collection of covers featuring an impressive lineup of guest collaborators) on May 24, while Interpol follow last year's "Marauder" studio album with a new five-track EP titled "A Fine Mess" on May 17. Of course, both acts are no stranger to our shores -- Interpol rolled through town last October at SDSU's Cal Coast Credit Union Open Air Theatre, while Morrissey performed in November of 2018 at Copley Symphony Hall (which, some of you may remember, ended with an overzealous fan rushing the stage). With any Morrissey tour announcement, it seems pertinent to point out that the famed, quiffed crooner (in 2002, the Smiths were named NME's most influential artist of all time) has developed quite a spotty track record over the years when it comes to canceling or rescheduling tour dates: In 2016, he canceled or postponed 17 out of 46 shows; the following year, he canceled nine out of 32; and in 2018, he postponed his entire UK/European tour (nine shows). 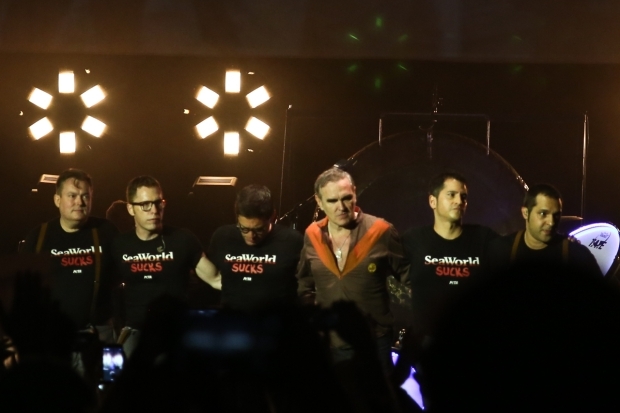 Thankfully, Moz has never backed out of a San Diego show -- so the odds are in our favor that he actually shows.